* Today, there was the monthly test of the tsunami warning system. E’s neighborhood is higher in elevation, so she lives above the evacuation zone. When we were staying in the hotel in Waikiki, the first several floors of the hotels were mostly dedicated to parking. This allows them to keep people safely on the upper floors in case of tsunami. * There are microclimates everywhere, but they are much more noticeable here. For instance, in E’s neighborhood, you can be walking in what seems to be a rain shower – while there are no clouds overhead and the sun is shining. The rain is falling in the Palolo valley and being blown into Kaimuki. * At home, I’ve never had a tiny chameleon show up in the bathroom, matching its color to the bathmat. * There is much more coverage in the news on climate change and renewable energy. Despite Hawai’i being the most remote islands in the world, the effects and the threat of more effects are real. * Because the angle of the sun is higher here, solar panels can often be placed on more than just the south-facing slope of a roof. * Unlike home, there is almost never a basement here. It ‘s strange to me to see water heaters just sitting outside under the eaves. * There is a lot more discussion and coverage of homelessness and affordable housing. Rents and real estate prices here are very high and there are many people who can’t afford them, even when they are employed. While there are single people who are homeless, there are also many homeless families. * The tension between the indigenous Hawaiians and the state is obvious. 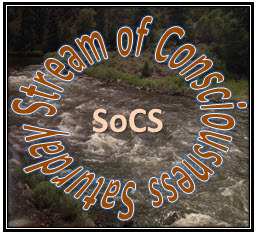 There are demonstrations almost daily against development of certain areas. While these problems are also present in New York, they are much more hidden. Driving here has been an adventure! Back home, it helps to hop on the highway. Here the highway, the H1, tends to be very slow and congested a lot of the time, so we only use it if we are going somewhere at an obscure time of day – or if we are going to/from the airport. It makes me chuckle every time I see an interstate sign – because the H1 can’t go to another state! It can’t even go to another island. The bigger challenge is driving the Honolulu streets. It dawned on me that Honolulu is the largest city in which I have ever driven. I am not used to being on a two lane road that suddenly morphs into a one-way street with five lanes. Well, I’m also not used to needing five lanes in one direction! Many of the main streets are named for members of the Hawai’i royalty, so there are lots of streets that begin with K and have four or five syllables. You need more than a quick glance to read the street signs, which is hard to do while keeping an eye on five lanes of traffic and the county buses. Fortunately, E is good at warning me which lane to get into in plenty of time and, by now, I’ve learned some of the common routes I am driving like between E’s apartment and her work. I guess things were getting a bit too routine, because on Sunday the maintenance light and the low tire pressure light on the Honda Fit I’d rented both went on. The maintenance looked like just an oil change, but the low tire pressure was a concern. I was afraid I might have a bead leak. This morning, after bringing E to work, I went to the car rental agency in Waikiki, as I really did not want to trek to the one near the airport. They offered to swap for another car, so now I have a spiffy Toyota Corolla. I drive a 2003 Corolla at home, but this new one is much more deluxe. And confusing. It took me a minute just to figure out how to get it out of park. There is a touchscreen! And a back-up camera! I do appreciate the back-up camera, but it is a bit disorienting to use when you are not accustomed to it. I’ll probably get used to it just in time to turn the car in next week. Until then, I’ll keep driving extra-carefully here in Honolulu. I am still in Honolulu, which probably seems to be the longest vacation ever, but it is really an extended visit with family. It started out looking pretty vacation-y with B and I staying in a Waikiki condo/hotel, although he was working via Internet part-time and I managed to get sick for a while, which cut down on some vacation-like activities. The real reason for the visit, though, was to spend time with our elder daughter E while her husband is away doing PhD research. After B went back East to travel for business, I moved into E’s apartment which is in the Kaimuki neighborhood, mauka (toward the mountain) from Waikiki. Kaimuki is one of the oldest neighborhoods of Honolulu and the house in which she lives, now broken into several apartments, is old enough to apply for status as a historic home. Fortunately, that doesn’t preclude its having solar panels on the roof. It is a mostly residential neighborhood, but includes some churches, schools, restaurants, and shops. Having never lived in a city, I am unused to neighborhood identity, but I’m glad that E and L live here because of the sense of community. President Obama’s sister lives in the neighborhood, although he doesn’t come to visit her when he comes to Hawai’i because the security would be a nightmare on the somewhat narrow and hilly streets. (I’m sure she gets to go visit him and his family, though.) When Ruthie Ann Miles won the 2015 Tony for best feature actress in a musical for her role as Lady Thiang in The King and I, E immediately knew that she was from Kaimuki. E and L were married at St. Patrick, the Catholic church in the neighborhood, where they are active in the music ministry. 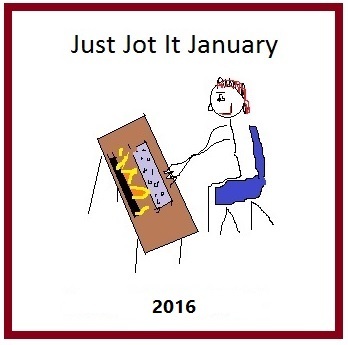 I have been learning my way around and doing what I can to help out. I bring E to work and back with the rental car, which gives her a break from her usual bus routine and shortens her commute time by half an hour each way. I also do some of the shopping and chores while she is working so we have more time for visiting and relaxing when she is home. So, I’m not really on a five week vacation – just lucky that, for now, my daughter lives in Hawai’i! 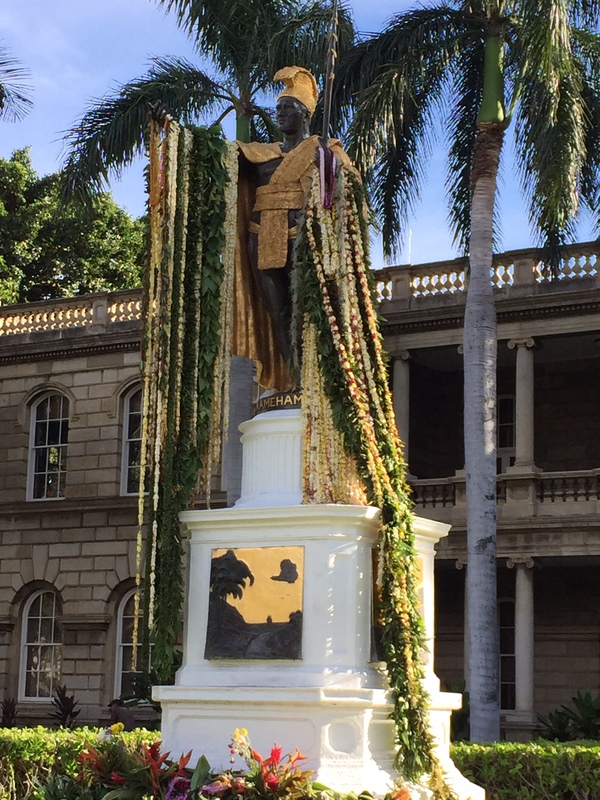 One of the traditional ways to honor King Kamehameha Day is to drape his statue in the historic district of Honolulu with leis. 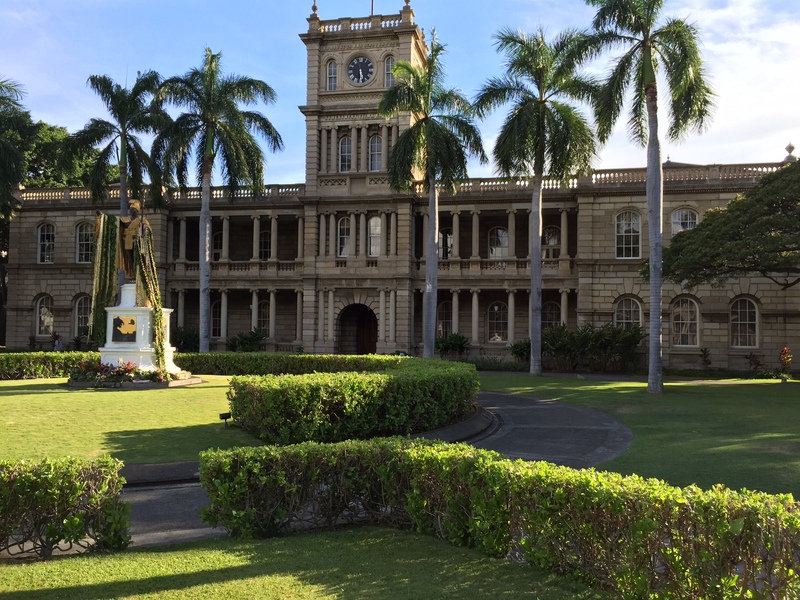 The statue is located in front of Aliiolani Hale, which is the home of the Hawai’i State Supreme Court. The statue is draped with plumeria and ti leaf leis, some of which are forty feet long. The plumeria leis are made by volunteers using donated blossoms. 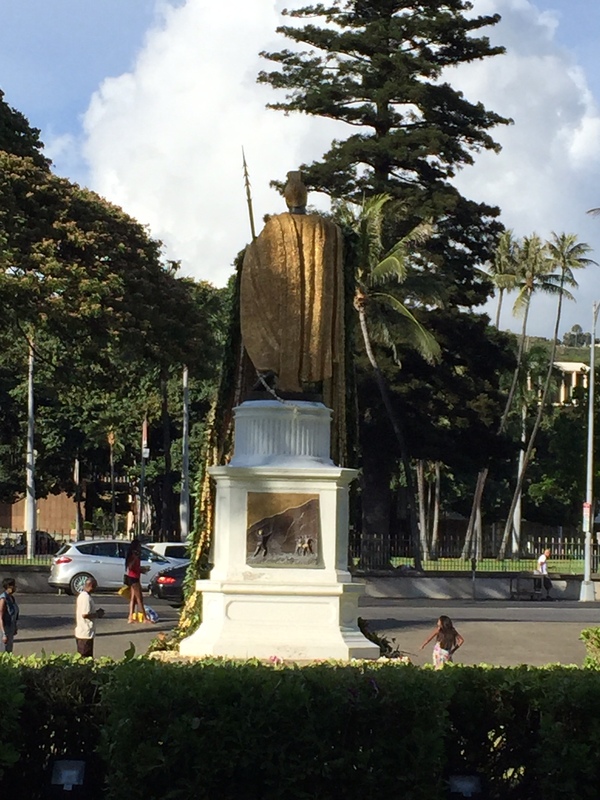 The leis are draped over the arms of the statue, not around the neck because leis are not ever placed over the royal feathered cape. Here, the cape is represented in gold leaf.